I was psyched to find out, from two German tourists getting ready to do some bicycling, that downtown Lagos was a 20-minute walk from the train station. 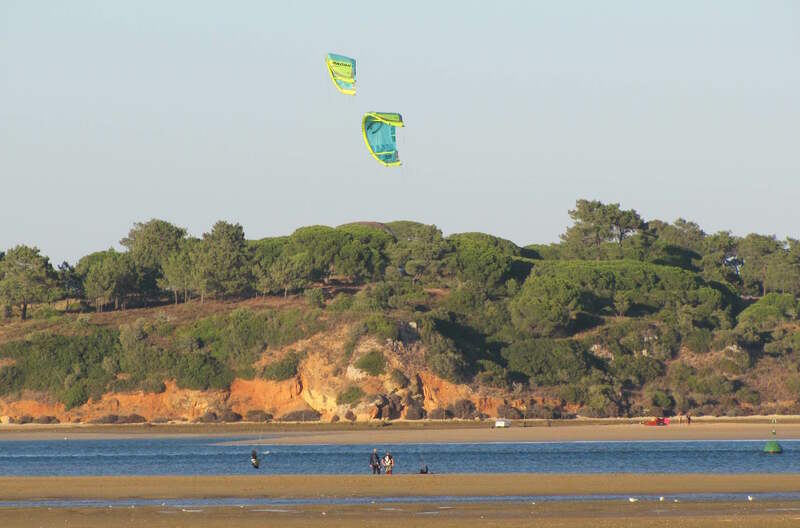 I had just arrived from Albuferia (a one-hour train ride about 40 miles away) and was going kiteboarding at nearby Alvor Bay. As I strolled through the marina I stopped to ask a local working at a tour boat stand where there was a good place in town to get lunch. “Caz, caz?” I asked, the bewildered look in my eyes also asking for help. Portuguese is a very difficult language and not nearly as close to Spanish as many people think it is. “Ca-zin-ya do Pe-tishcoo,” she said slowly. “Here, I write it down.” She jotted it down for me on one of her company’s pamphlets. “Cool, great,” I replied. “Obrigado!” (Thank you and one of the easier Portuguese words). “Okay, great. Obrigado,” I repeated, nodding appreciatively toward her. The ancient city of Lagos, in Portugal’s southern Algarve region, has over 2,000 years of history and was a Celtic settlement before the Carthaginians showed up. Then the Romans moved in, enticed by Lagos’ natural harbor. Conquered by the Moors in the eighth century the Portuguese took it back five hundred years later. 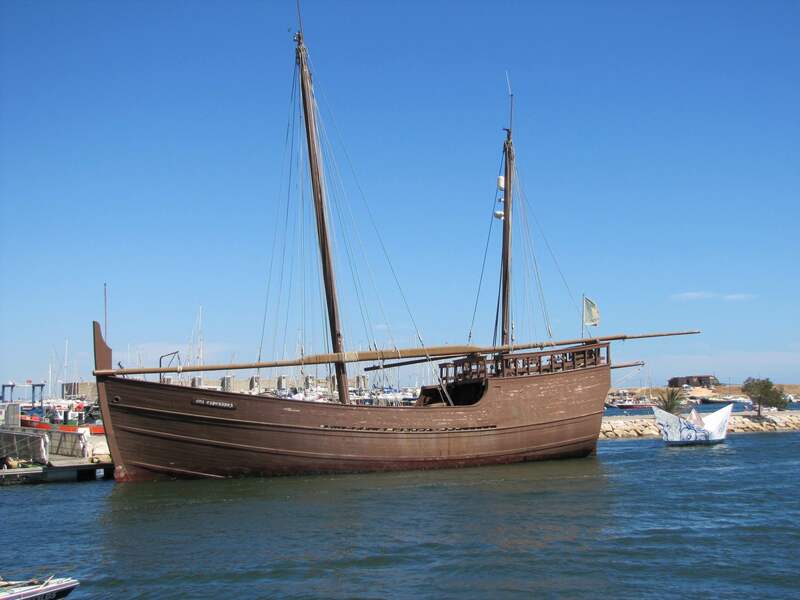 By the 15th century Lagos had become the main harbor for Portugal’s audacious maritime explorers. Prince Henry the Navigator dispatched ships – caravels, the fastest sailing vessels at the time due to their innovative, triangular-shaped sails – from Lagos during the Age of Discovery, an era that would make Portugal the richest country on earth by the 16th century. Walking along the Avenida dos Descobrimentos (Avenue of Discoveries), a tree-lined promenade with street vendors that parallels the canal leading to the harbor you can see a replica of one of the caravels, the Boa Esperança. The original ship sailed all the way to the Indian Ocean and, with a deck shaped like a horse’s saddle to facilitate water run-off, was prepared for the harrowing journey. The ship’s name translates in English to Good Hope, an homage to Bartolomeu Dias who, in 1488, became the first European to successfully sail around the treacherous Cape of Good Hope at the southern tip of Africa. I cross the busy Avenida dos Descobrimentos and make my way into downtown Lagos. The streets are narrow and the buildings are low, three to four stories high, with shops and restaurants on the ground level. Soon I’m in the first town square. I turn up another narrow street and find the next town square. Here I see a curious sight: a street performer who appears to be levitating. The woman is wearing baggy pants, is cross-legged and seems to be hovering about three feet off the ground. Her head and face are wrapped in a white cloth. Only her eyes are exposed. One hand is held out, motioning forward, while the other hand grips a thick, bamboo pole extended to the ground. She has a painful look in her eyes. A man sits on a brick ledge nearby playing classical Spanish music on a guitar, his guitar case open on the ground with some euros in it. 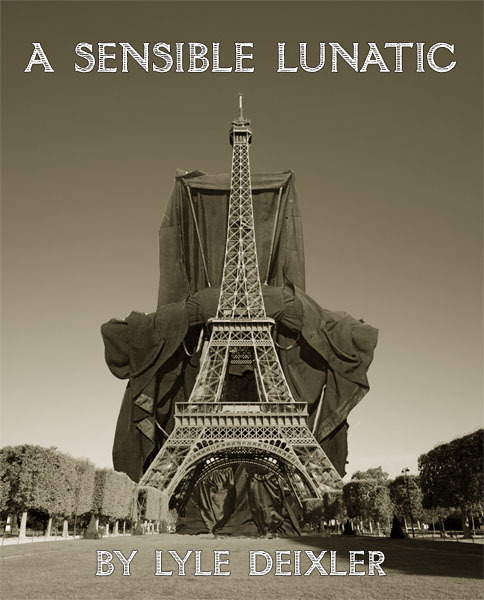 The “levitating” woman’s expression doesn’t change until a friend stops by. The street performer pulls the cloth down from her face and has a quick, amiable conversation in Portuguese with her. The performer then pulls the cloth back up over her face and the painful look quickly returns to her eyes. 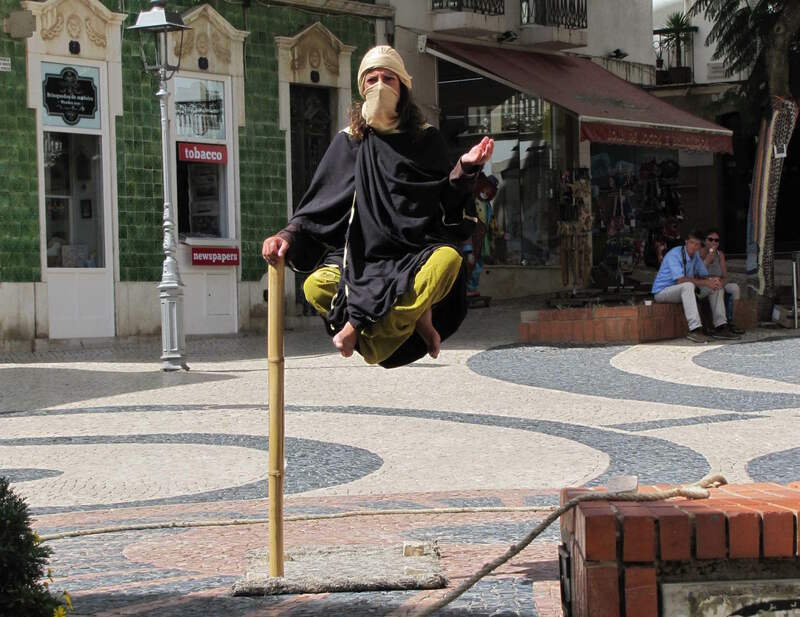 I find out later (from my friends in Albufeira) the trick is in the bamboo pole. There’s a metal bar in the pole attached to another bar hidden beneath the cloak she’s wearing. That bar is connected to another bar she’s sitting on and it’s all covered by her attire. And given the look in her eyes the contraption didn’t seem very comfortable. I take some pictures, walk down another narrow street and soon find Casinha do Petisco. It’s small, with about 12 tables inside, and packed. I get lucky and a couple is leaving and I get their table. The crowd is mixed, I hear Portuguese spoken at several tables but the people sitting next to me are tourists from England. The menu has several traditional dishes but I’m only interested in the seafood. I see sea bream, golden sea bream, sardines and sea bass. I ask the waiter what’s the difference between the regular and golden sea bream. He says the golden sea bream have a gold mark behind their eyes and a little more flavor so I order that, grilled. 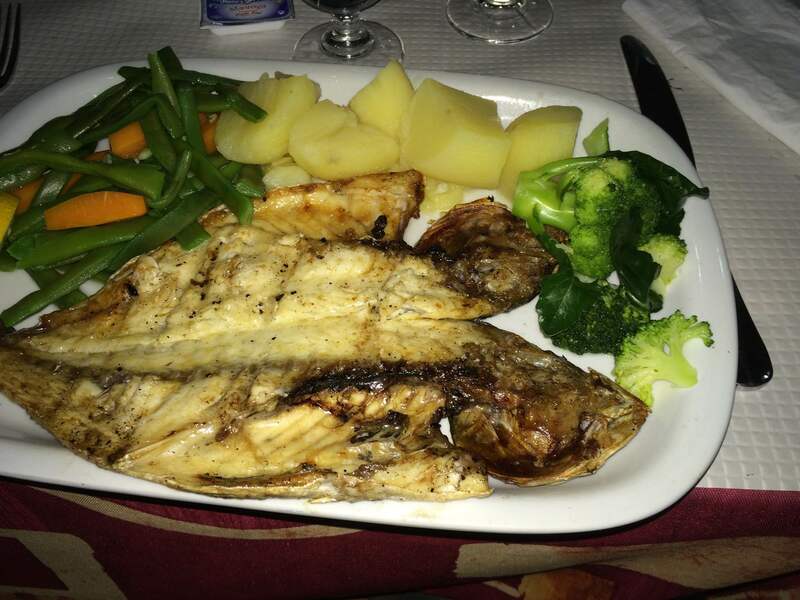 The fish is served whole with some potatoes and steamed vegetables. It’s a white fish, fresh and delicious. And tastes even better with the Portuguese wine I’m drinking. I head back to the train station to wait for the kiteboarding shop to pick me up. There’s a small cafe there and I want to check my email. “Sometimes,” he says with a tired look, as if he knows what’s next. “Do you have wifi?” I ask. I pay for the water and he gives me the password for his network. Ten minutes later an old, beat-up Range Rover from the kiteboarding shop pulls up and Anna, a kiteboarding chick from England kiting and working in Portugal for the summer, takes me to Algarve Watersports. At this point I’m only worried about two things: good wind and how I’m going to get back to Albufeira. The last train from Lagos is at 8:00 p.m. When I spoke to Anna the previous day she said they usually don’t get back to the shop until eight and that I could take a cab back to Albuferia but it was expensive, about 60 euros. I figure okay, I may never be here again and I really want to see this bay and do some kiteboarding so it should be worth the money. At the shop we (two kiteboarding instructors and some clients taking lessons) take the Range Rover and two other beat-up, old SUVs out to the bay. When we get to Alvor Bay it’s absolutely beautiful. The city of Alvor is on the far side and the bay spills out into the Atlantic Ocean. We park on the side of an unpaved road and trek about 1,500 feet on a rocky, dirt-covered seawall that cuts off one corner of the bay to get to the beach. The wind is from the northwest 18 to 20 mph, scratching the mid-20s in the gusts. Across from our beach is a wide area of flat water but no one is kiting on it. Everyone is downwind of it and I wonder why nobody is kiting on this sweet, near-glass patch of water. 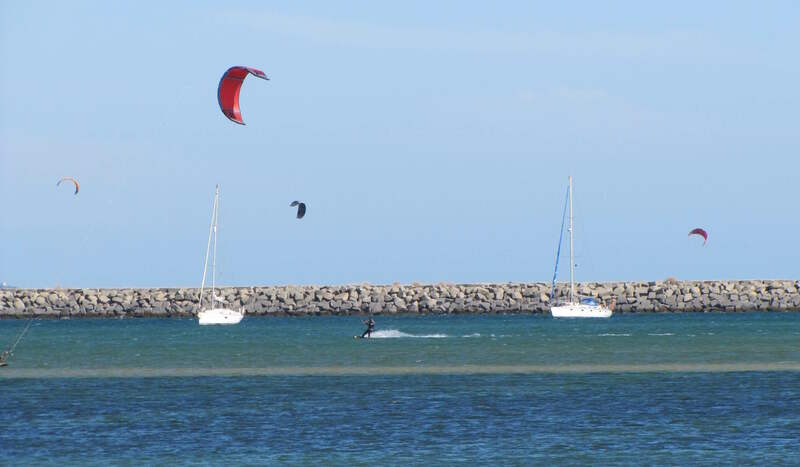 The wind is gusty since it’s coming over land but it’s still good and I certainly can’t complain – I’m kiteboarding in Portugal! I hit some jumps and have a great afternoon on the water. 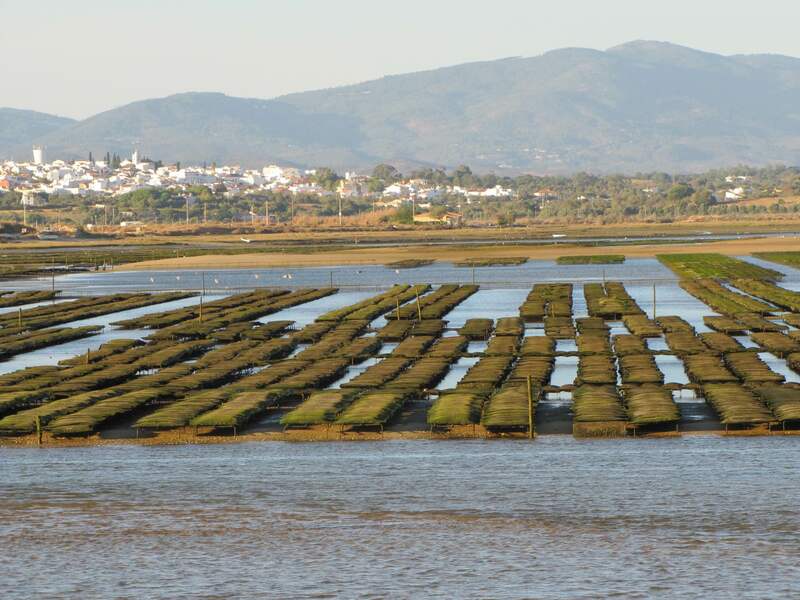 Back at the beach the oyster farms are exposed and resemble huge slabs of sod sitting in the bay. It’s about 7:15 p.m. and I ask Filippo if he could get me to the train station in time for the last train. He says he’ll try and asks everyone to hurry while packing up. We get to the SUV at 7:35 and I’m thinking cool, I might make it. Filippo is about to get in when he says, “damn, my dogs!” He calls out to them, fortunately they were close by and quickly came running to us. The dirt road leading from the bay is a single lane with two-way traffic. Filippo drives fast and only slows down slightly and pulls over a little when another car approaches. He ignores the big tree branches scraping the side of our SUV. His stunt driving works and he gets me to the train station at 7:58. I thank him graciously and tip him ten euros. When the train pulls into the first station after Lagos it’s closed, the lights are off and it’s too dark to read the sign. The same thing happens at the next station. Uh oh, I think, I have to know where we are so I know when to get off! I had a schedule in my backpack so I took it out and started counting the stops to Albufeira. I also wanted to check with the conductor so when he walks by I ask him if he speaks English. “Nao,” (no) comes his reply. “Sim, sim,” (yes, yes) he says. Fortunately the next station was lit up and I could see where we were. With two stops to go I grabbed my bags and waited by one of the train’s exits. The conductor walked by and said, “Albufeira, dois. 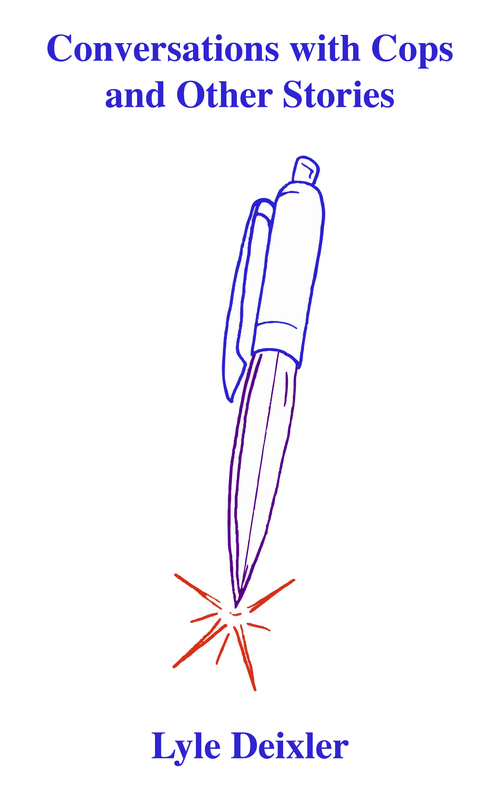 Dois.” He then held up two fingers.